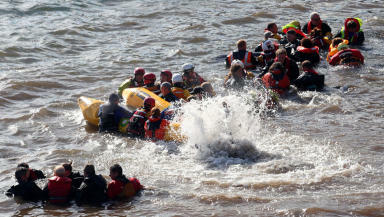 Rescuers are concerned as the animals are heading away from the sea. 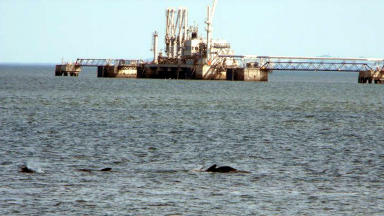 A pod of whales which survived a stranding in Fife have moved further up the Forth to Kincardine. Rescuers hope the animals are taking advantage of a boom in squid numbers in the area before heading back out to sea but are monitoring their movements. Seventeen whales died on the beaches near Anstruther and Pittenweem after beaching on Sunday. Ten were rescued and headed down the coast to Leith, where one of the pod beached again and died. Rescuers now believe the nine surviving animals have joined up with other whales from the pod. They were spotted near Kincardine on Wednesday night. Gareth Norman from the British Divers Marine Life Rescue (BDMLR) said the whales were heading the wrong way. But fisherman have reported a high number of squid in the area and it is hoped the pilot whales are feeding before heading back out east to sea. 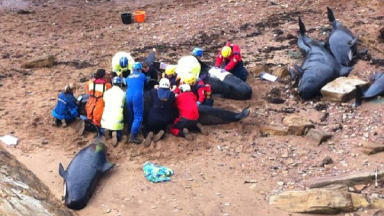 Post-mortems carried out on the dead whales in Fife did not show any obvious signs of disease. An investigation is still being carried out to find out why the pod beached, with volunteers focusing on whether or not the animals were deafened by something, which would affect their navigation. Members of the public are warned to stay away from the whales, as getting too close to them could distress them and lead them further away from the sea.